Words cannot express the loss and sorrow I felt when I learned the news of Keith's passing. So many memories have been rushing through my head. As a high school student I worked both during the summer and after school at Gelb Music. It was quite possibly the best job any high school student could have. When I became a stay-at-home Dad with my daughter I worked at Gelb Music on Saturdays to make a little extra pocket change. The friendships I made at Gelb Music are long lasting ones and the people who work there are incredibly special to me. I recommend Gelb Music to everyone I meet and Keith was one of the many reasons I knew I could recommend the store. Keith was one incredible person. Days spent behind the counter laughing and joking or talking about baseball or music will be forever in my memory. Giants games - taking the Oakland/Alameda ferry with two sandwiches and sodas and meeting him on the third deck. Talking about life. Learning about baseball score keeping. He was there for me when I was going through some tough times. Keith would always show up for my gigs and sometimes change strings for me (I often broke strings during our sets) when I didn't have a roadie. He always had good advice about life and gear. It is hard to believe that he is gone. In the words of the owner of Gelb Music (another very special person to me), Kevin Jarvis, "Keith [Ketman] Shirasawa passed away early Saturday morning in New York due to complications after emergency surgery for a freak roller coaster neck injury. The surgery had been deemed successful and his prognosis was a complete recovery. He was still hospitalized but making plans to return to the bay area when he unexpectedly died.There are no words to express the shock and grief we are feeling after losing our beloved Keith in such a senseless tragedy. He not only was one of the kindest men I have ever known, he loved his job and he loved Gelb. His humor, incredible knowledge, dedication, and selflessness were unparalleled in the music business. The hole he has left in our hearts is massive. Somehow we will have to continue, knowing he will never again resume his accustomed position behind our counter." I've shed quite a few tears over this loss. KEITH KATSUMI SHIRASAWA Was a 53-year old Santa Monica born resident of Redwood City, CA, who passed away in Brooklyn, NY on August 4, 2007 as a result of an injury sustained from an accident while riding on the Coney Island Cyclone Roller Coaster. A celebration of Keith's life will be held on August 19, at l:00 p.m., at the Mountain Meadow Estates, 102 Canada Road, Woodside, CA 94062. Upon graduation from University High School in West Los Angeles, Keith attended California State University at Northridge where he earned a Bachelor of Arts degree in Political Science. He later earned a dual Master's degree in Gerontology and Urban Planning at University of Southern California. In the early 1980's Keith relocated to Northern California when he accepted a position with the San Mateo County's Area Agency on Aging, where he ultimately became Director. However, Keith slowly began to gravitate toward his real passion, music. He would hang out at Gelb Music after work and started working there on Saturdays. Keith eventually made a meaningful and lasting career change and started working at Gelb full time, where he remained for the last 20 years. In Keith's spare time, he played guitar in a band, "Along for the Ride" that performed at local clubs and for various charities. 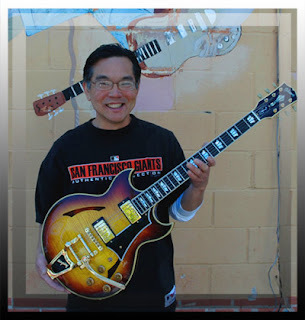 In addition to his love of music, he was a loyal fan of the San Francisco Giants. Please visit www.gelbmusic.com for additional information. Keith is survived by his significant other, Linda Walker; sister, Ayako Masada; nieces, Cynthia Masada (Jeffrey Pepe), Lynn Masada (Eli Akiba); grandnieces, Nicole Pepe, Sami Akiba, Talia Akiba and grandnephew, Anthony Pepe; cousins, Robert Maruoka, Skip (Mona) Masuda, Gary (Kathryn) Hirano, Kai Hirano, Michael (Robin) Hirano, Ruth (Ted) Kearn and Aya (Jim) Johns. Published in the Oakland Tribune on 8/17/2007. To check out Keith's band - Along For The Ride - click here.